Fried rice is nothing new for the Stewart family. I have already written about the chicken fried rice we love. And I mentioned in that post that you could use any meat you like or have prepared in your fried rice. 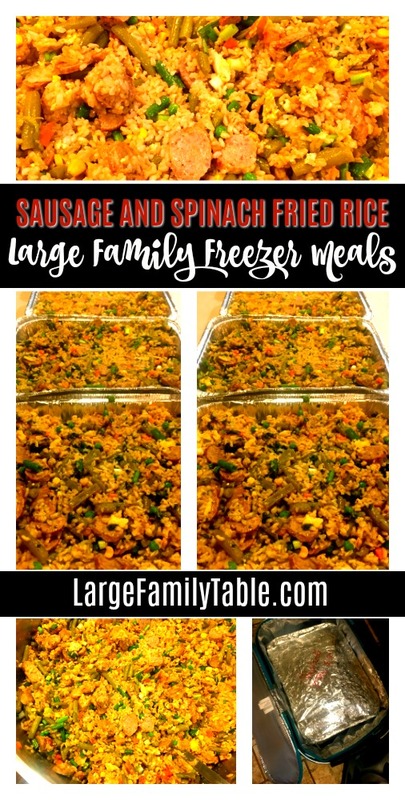 So I decided to do just that when I pulled together this Sausage and Spinach Fried Rice large family freezer meal. I got some 5-lb bags of precooked mild sausage slices during a recent trip to my local Sharp Shopper and I knew they would be perfect for my huge batches of fried rice! This recipe is almost identical to the chicken fried rice except for a couple of things. The first is, I used the mild Italian sausage. I also added spinach to these pans. And then, I went kind of all large family mom meal stretching and threw in a #10 can of green beans along with the 5-lb bag of frozen mixed veggies while I was at it. Dump veggies into a pot with the 1/2 cup of sesame oil and toss on medium heat until completely thawed. Combine the cooked rice, veggies, sausage or other meat, spinach, scrambled eggs and soy sauce in whatever huge pots or bowls you have. You might have to use several bowls or pots to get it all mixed up. Just do what you can and get it all stirred together. Once it’s all combined, divide it evenly among your baking pans. 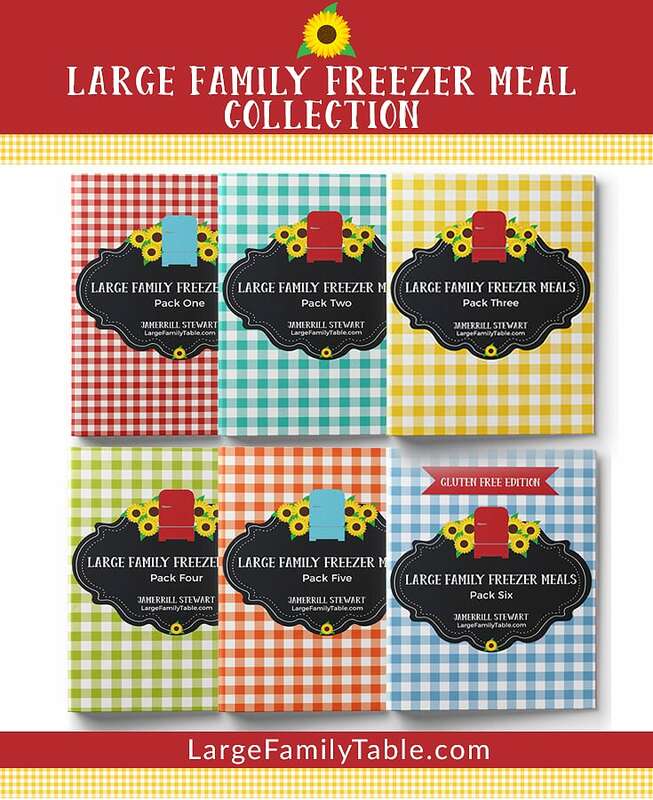 Allow your meals to cool completely before placing in the freezer. Set the desired pans of Sausage and Spinach Fried Rice out in the refrigerator the evening before you’d like to serve them. Preheat your oven to 375 (oven times may vary). Place in preheated oven for 1 hour or until heated through. 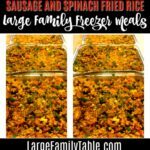 I made these multiple pans of Sausage and Spinach Fried Rice during day two of my latest freezer cooking days. 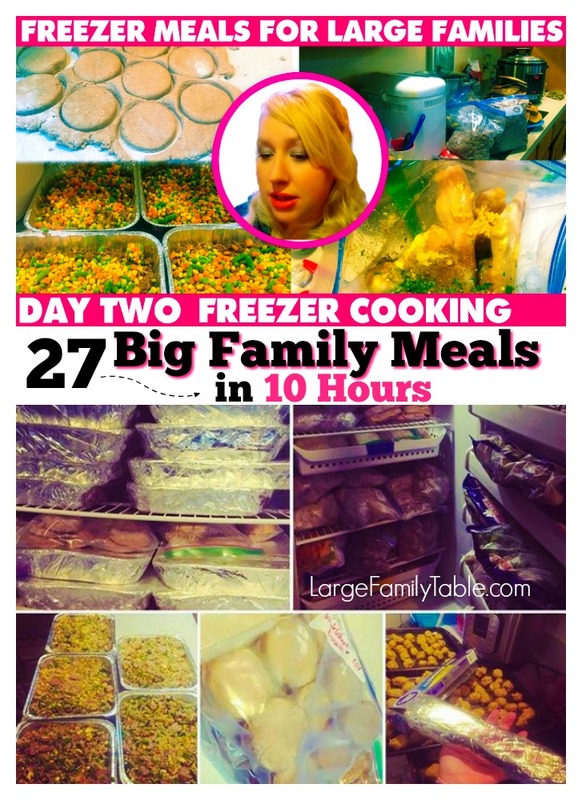 Click here to see the 27+ big family meals I made in 10 hours!